September was a fairly quiet month with only a few decent bumps in fan growth. 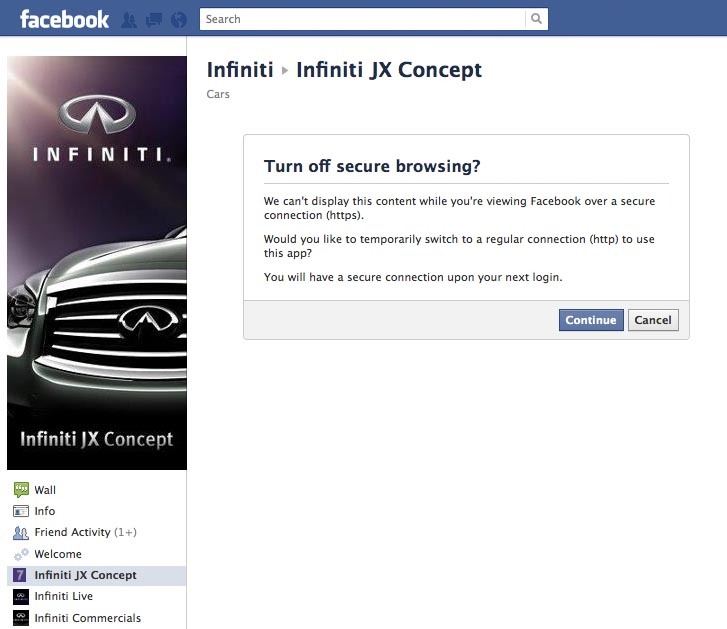 I'm also seeing a lot less automotive fan driven ads from automotive brands. 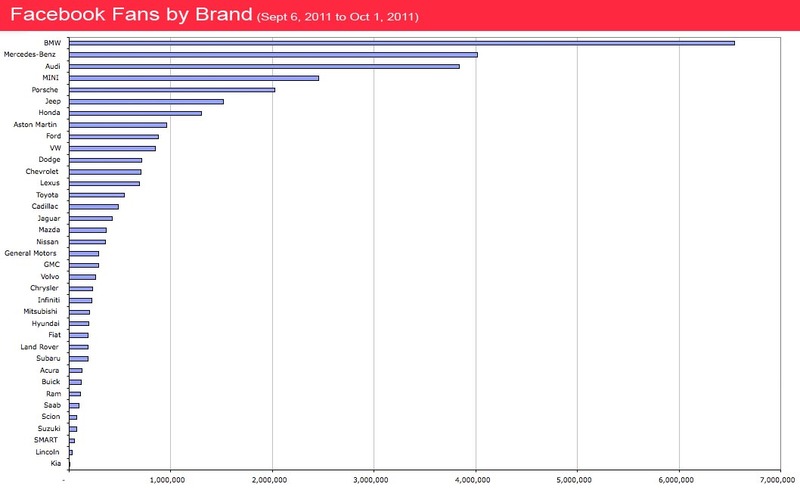 That's not to say the OEMs are not advertising on Facebook, it's just their ads are driving to the brand's website instead of a Facebook fan page. Perhaps we are seeing a move away from the importance of fan growth to drive to transaction or consideration at a brand website that hosts content relevant to purchase. It's been awhile since we've seen a brand lose fans in the span of a month. In fact, the only time it's happened since tracking this data in April 2009 is when Infiniti had lost fans due to their over promotion of a circ de soleil event they did one month where their sponsorship team posted too many photos of acrobats to the annoyance of its fans. 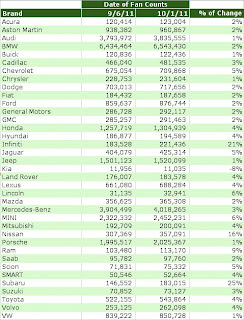 This September Kia dropped 8%, the largest negative drop we've seen in one month. There is nothing blatantly apparent why they had a negative fan growth, perhaps it's due to their younger audience who may have fanned the page due to their hamster Soul campaign only to unfan later once the interest waned? 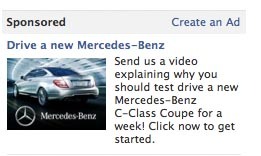 Mercedes Benz is driving consumers to a social campaign they are running on Facebook. The C-Coupe Your Week contest will give 10 of its Facebook fans a C-Coupe to drive around for a week. Fans will also be featured on the Facebook page and given $2,000 and camera equipment to capture their week. Contestants must complete a form and upload a video by October 14. Subaru's 25% increase in fans for September was the largest gain. Their push was most likely driven by their charitable campaign Share the Love Charities where fans voted on several organizations resulting in Make A Wish as the winning charity for the Facebook fans. People who purchase a car between November 19 and January 3 get to choose where to allocate $250 to one of five organizations. 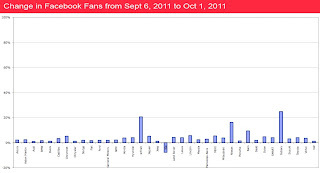 The campaign resulted in 183,000 likes demonstrating fans responded positively to the effort. 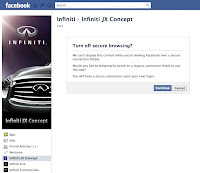 Finally in my evaluation of this month's fan growth several fan pages operated outside of a secured connection causing Facebook tab experiences unavaiable if a user has security settings active (use of https.) Odd because this is a fairly easy situation to get around with a good tab development team. I have your answer Senor Baccus. Often when a brand runs a promotional app requiring you to 'Like' the page people will do it just for the promotion and then 'Unlike' after. I have seen this. 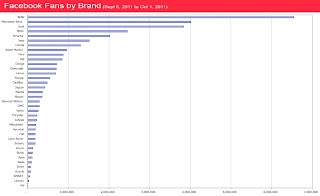 Proves yet again people don't want brands in their stream except for the 1-4 they seriously are passionate about. There is a definite relationship of like then unlike when running promotions. 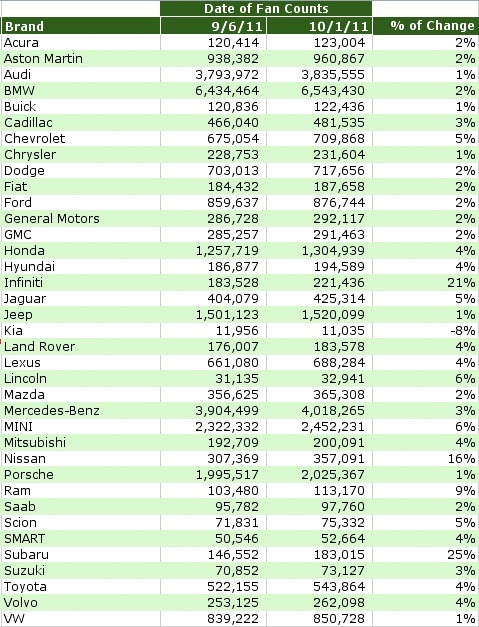 That said, there are not a lot of promotional offers in the automotive space. Most ads drive to new vehicle launch info or some effort around a contest; though, I'm sure the enter a contest then unlike is similar to deal promotions common to other consumer products.